Whether water freezes to ice, iron is demagnetized or a material becomes superconducting – for physicists there is always a phase transition behind it. They endeavour to understand these different phenomena by searching for universal properties. Researchers at Goethe University Frankfurt and Technische Universität Dresden have now made a pioneering discovery during their study of a phase transition from an electrical conductor to an insulator (Mott metal-insulator transition). According to Sir Nevill Francis Mott’s prediction in 1937, the mutual repulsion of charged electrons, which are responsible for carrying electrical current, can cause a metal-insulator transition. Yet, contrary to common textbook opinion, according to which the phase transition is determined solely by the electrons, it is the interaction of the electrons with the atomic lattice of the solid which is the determinant factor. The researchers have reported this in the latest issue of the “Science Advances” journal. The research group, led by Professor Michael Lang of the Physics Institute at Goethe University Frankfurt, succeeded in making the discovery with the help of a homemade apparatus which is unique worldwide. It allows the measurement of length changes at low temperatures under variable external pressure with extremely high resolution. In this way, it was possible to prove experimentally for the first time that it is not just the electrons which play a significant role in the phase transition but also the atomic lattice – the solid’s scaffold. “These experimental results will herald in a paradigm shift in our understanding of one of the key phenomena of current condensed matter research”, says Professor Lang. 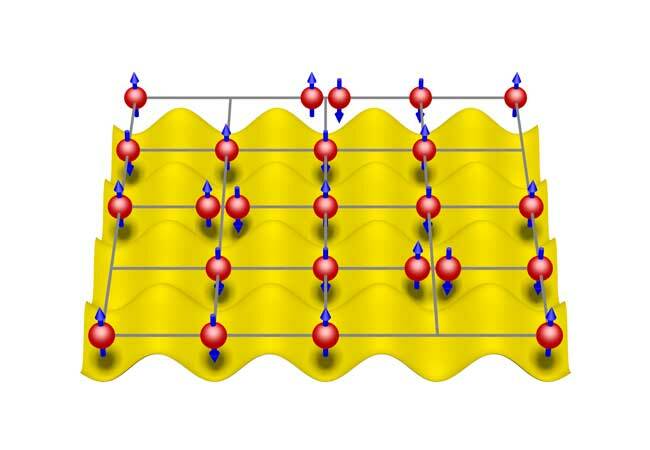 The Mott metal-insulator transition is namely linked to unusual phenomena, such as high-temperature superconductivity in copper oxide-based materials. These offer tremendous potential for future technical applications. The theoretical analysis of the experimental findings is based on the fundamental notion that the many particles in a system close to a phase transition not only interact with their immediate neighbours but also “communicate” over long distances with all other particles. As a consequence, only overarching aspects are important, such as the system’s symmetry. The identification of such universal properties is thus the key to understanding phase transitions. “These new insights open up a whole new perspective on the Mott metal-insulator transition and permit more sophisticated theoretical modelling of the phase transition”, explains Dr. Markus Garst, Senior Lecturer at the Institute of Theoretical Physics of Technische Universität Dresden. The research work was funded by the German Research Foundation in the framework of the Collaborative Research Centre/Transregio “Condensed Matter Systems with Variable Many-Body Interactions” led by Professor Michael Lang. Elena Gati, Markus Garst, Rudra S. Manna, Ulrich Tutsch, Bernd Wolf, Lorenz Bartosch, Harald Schubert, Takahiko Sasaki, John A. Schlueter, and Michael Lang, Breakdown of Hooke’s law of elasticity at the Mott critical endpoint in an organic conductor, Science Advances 2, e1601646 (2016).